Heat grill. In large bowl, combine ground beef, pepperoni, olives, bread crumbs, egg and 1/4 cup of the pizza sauce; mix well. Shape mixture into 5 patties, 1/2 inch thick. To toast buns, place cut sides down on grill during last 1 to 2 minutes of cooking time. Top each patty with cheese pieces; cook just until melted. Meanwhile, heat remaining pizza sauce in small saucepan over medium heat. Spread sauce on cut sides of toasted buns. 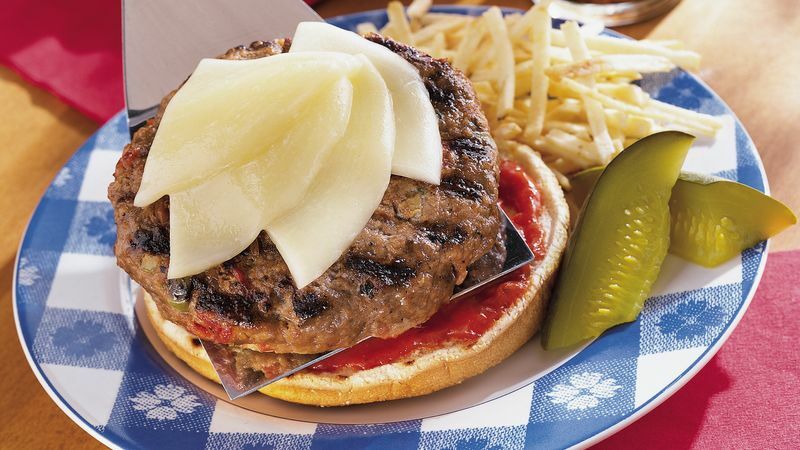 Serve cheese-topped patties in buns. To broil patties, place on broiler pan; broil 4 to 6 inches from heat using times above as a guide, turning patties once and placing buns on pan during last 1 to 2 minutes of broiling time. Top each patty with cheese pieces; broil just until melted. These juicy burgers have the great taste of pizza tucked inside a neat-to-eat sandwich. Serve shoestring potatoes and beans salad with these burgers. For dessert, combine cubes of cantaloupe, a little honey and orange juice in a blender container. Cover; blend until smooth. Serve over vanilla ice cream.